"I was in a dilemma when I had the feet of God and my Guru in front of me. I chose my Guru’s feet as that was a path to God himself!" - So said the mystic poet Kabir. This exemplifies our eternal teacher-disciple lineage called the Guru-Shishya parampara. As a backbone, this tradition honed several generations for centuries and has now gradually diminished. The only thread that lingers itself and gives glimpses of this tradition is the cultural arena- Indian Classical arts. Inheritance of this parampara has come down intact through the ages, but its raw essence has not been emulated - a visible loss. Gurukul was the place where a pupil dedicated himself completely to the pursuit of education. 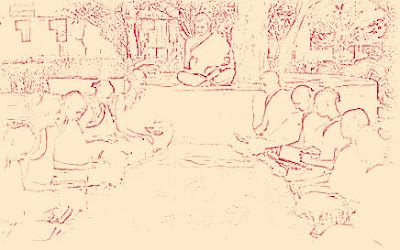 Each Shishya was unique and so was the form of imparting knowledge to each individual. This today is past with tutelage of performing arts becoming a de rigueur. In classical dance form, performing to compete, be in the public eye and maintain a status has taken precedence. Many schools have sprung up merely catering to this mad race and surge. As a consequence, a one to one relationship has metamorphosed into a one to many, with a ‘teach however you can’ atttiude. 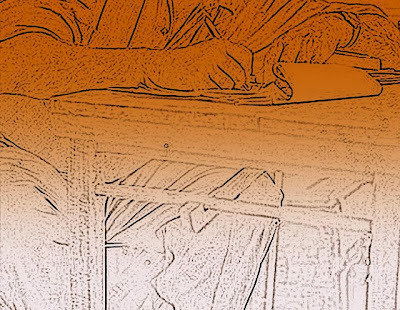 Teaching in these schools have been structured to nurture a herd of artistes, with no efforts for identifying an individual's inborn expression. The fact that natural gift has a lot to do with successful study of art is long forgotten. More so a gifted artiste’s need for an atmosphere of freedom and self-reliance in the learning process and ultimately her psychological growth has been sidelined. Theory behind practice is neither fully understood nor explained. It leaves the student with a void, limited faculties and perennial wonderment of how to come up with beautiful compositions and improvisations. This results in a dismayed student, who switches gurus without realizing the essence and finally gives up artistic pursuits in the lure of the materialistic world. A few who remain, either end up in no man’s land or struggle their way to the top. Then again, this is about the student. How about the Guru? He is the giver of direction, making the knowledge available in plenty. If the student does not get it, it is upon her to work out and improve. The guru takes the student from the familiar to the unfamiliar, the known to the unknown, from the concrete to the abstract, steering her towards his objective. He becomes more a friend, than a philosopher or a guide. As a friend he introduces them to varying influences to broaden and enhance the learning experience. But despite concerted efforts of many gurus, the problem persists due to plethora of options available today. After years of investment of time and energy, the student turns to fame and glory, to prosper materially, blinding herself from the very fact that education is the base of prosperity. The guru finds in disarray that he was constantly ramming with an idea, which was going nowhere! Just like any constitution can be amended, any organization can be restructured. We need to brainstorm as to where this culture in classical arts is leading us to. Is the current scenario of Guru-Shishya parampara a healthy one? Or is the turn towards individualistic experiments (with the support of multimedia technology) taking the right path ahead? Are we rightly fostering the roots of a veteran tree? If not, why not plant a new healthy sapling?